CAMERA brought dozens of students from across the US to participate in Leadership and Advocacy Training Conference. 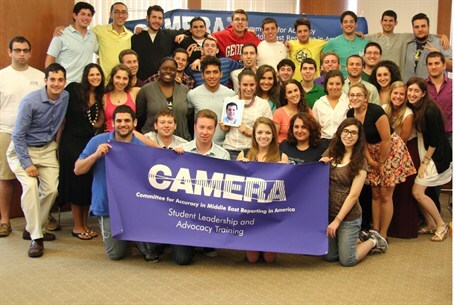 The Committee for Accuracy in Middle East Reporting in America (CAMERA), brought nearly 40 students from across the United States and Canada to participate in its second annual Student Leadership and Advocacy Training Conference. The conference, which took place August 19- 21 at the Boston University Hillel, was aimed at instilling courage and empowering students to be strong, pro-Israel activists. It focused on combating anti-Israel campaigns and the importance of spreading accurate news coverage and commentary about Israel and the Middle East on campus. The event included a series of prominent experts such as CAMERA’s Christian Media Analyst Dexter Van Zile and Dr. Richard Cravatts, a professor at Simmons College and the author of the book Genocidal Liberalism: The University’s Jihad Against Israel and Jews. Other speakers included Sharon Singer, director of public affairs and social media at the Consulate General of Israel in Philadelphia, who spoke about how to restore factual, positive portrayals of Israel in university settings. Students discussed the boycott, divestment, and sanctions (BDS) movement targeting Israel, took part in writing and role-playing workshops, and discussed event-planning strategies in depth. “No longer do any of us feel alone in the fight. We have met our allies in Boston, we know that CAMERA has our backs, we have met the non-Jews who believe in us and are willing to fight by our side,” he said. Jewish as well as non- Jewish students from dozens of universities including Concordia, Dartmouth, MIT, and University of California at Santa Cruz flew in to attend the conference. CAMERA, now in its 30th anniversary year, has 65,000 members in more than 12 countries, with Web sites in English, Hebrew and Spanish.